They’ve been a fixture at University of Hawai'i athletic events for more than 25 years. So it’s no surprise that they’re recognized as the most fervent fans of UH volleyball. They sit up front in one corner of the stands—he same corner every match. They cheer. They wave signs. And they come bearing a lot of lei. They’re affectionately known as the Aunties. 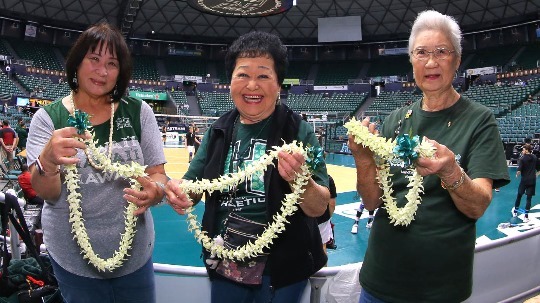 Lauretta Sewake, Lenora Yagi, Cookie Kim, and Ellen Tamura, all retired teachers, have hardly missed a beat since they started supporting UH teams all those years ago. At every volleyball match, the Aunties give lei to each member of the UH team and the opposing team and the announcers. That’s up to 40 lei for each match. Island Scene spoke with them on the third-straight night of a men’s volleyball tournament. So that means more than 100 lei were presented that week. Do they buy them? Do they get their friends and gather around a big table to make them? Kim provided the answer to the question that everyone is asking—here do the lei come from? “I just keep on sewing,” Sewake says matter-of-factly. The support of the Aunties has always meant a lot to the players. Robyn Ah Mow-Santos, who’s preparing for her third season as UH women’s volleyball head coach, fondly remembers the Aunties from her playing days in the ‘90s. Ah Mow-Santos recalls the love the Aunties gave one of her teammates, Angelica Ljungqvist, who’s now an assistant coach with the team. Coming from Sweden, Ljungqvist didn’t have family here. “We give them a lot of hugs,” Yagi says. “I think they miss their mothers. Gwen Nakamura is the assistant band director at UH. At every Wahine volleyball match, she leads the band wearing a balloon hat. She wears them for fun (no superstition involved); a tradition started about 20 years ago. Nowadays, it’s an alumnus of the band that makes them. Nakamura says that Keith Takeda, who makes balloon animals for parties as a side job, had volunteered to take over as the milliner. The variety of hats that Takeda has made for her is amazing, from Angry Birds to pumpkins to rainbows and more. But there are some standouts. “Other than the UH ones, I would say my favorite is the Christmas tree,” Nakamura says. “It had small balloons that were the ornaments. I always give the balloon hats to a kid, but that particular one, I didn’t give it away. I took it home and gave it to my nephew who was about 6 at the time; he’s now 22. Keith made me another one the next night and I took it home and my nephew and I wore them together." Teams will gather at the Stan Sheriff Center for the 2019 Big West Men’s Volleyball Championship April 18–20. For tickets or more information, call 956-4482 on O'ahu. This is the second year that the Big West has held a tournament to decide its men’s volleyball champion. In the inaugural event last year, UH lost in the fi nal match to tournament host Long Beach State.